[Updated] Traffic is presently barred from entry, and residents are being blocked from returning home in the Glebe Road, Pembroke area as Police are presently in the process of conducting apartment search[es] for a man whom the Police have referred to as a “person of interest” and a “fugitive from justice”. 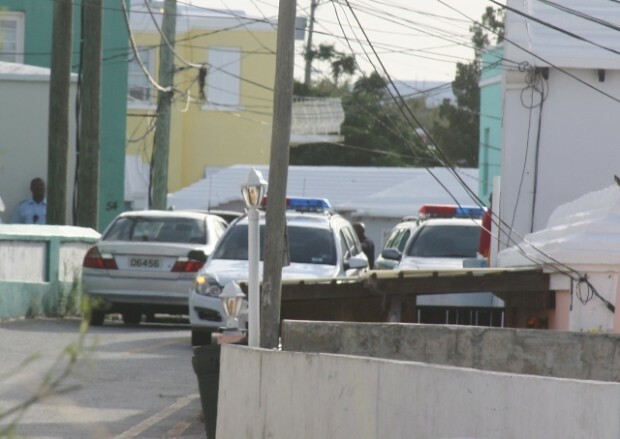 The Police have not confirmed the exact identity of the individual they seek, however speculation amongst residents on scene is rampant that it may be the escaped prisoner they are searching for. As of this writing [6:35pm] there are several Police officers on scene, including armed officers. The exact area being searched is the area by Yardie Kitchen. Police would like to apologize to the residents of the area, and thank them for their co-operation. Update 7:00pm: Police confirm they are looking for Alvone Maybury, who escaped from prison officer’s custody on July 13th. Update 7:30pm: Police search continues, there are approximately 20 officers on the scene, the canine unit, armed officers etc. Update 8:20pm: Police [all but one vehicle] leave the scene, we counted eight Police vehicles in total [marked and unmarked]. Residents are relieved to be able to go back home, many had been prevented for a number of hours. Around 4pm today (Friday), Police attended a residence on The Glebe Road in Pembroke as they continued their search for Alone Maybury. Officers canvassed the area with negative results. Police continue to follow all leads and are reminding the public that providing shelter and resources to Maybury is a crime punishable under the law. Time for Cablewizion to take control. Where’s IB……………. Are the police using the GPS’s from the Taxi’s to find Waldo? Looking at that picture makes you wonder why a so called wealthy country looks like a third world one. Don’t you think it’s time to clean up that area? Especially the cables. Good lord. if you do not have anything nice to say about my country remain quiet there are alot of things people do not understand because they dont read clearing they are talking about the fugitive and the picture is of an area know to the fugitive and if you didnt know there are alot of house in this area that need lights and what happen to metal when it gots hot ???? humm that should be an easy one right ! !